Whoop Whoop.. Another successful event! This month Dino and myself have noticed that the forum post for organised events isn’t being used as much as we would like.. I can’t express enough that it is *essential* that if you are building a room or have an idea for a room that you MUST post it on the forumso that Dino and myself know when it comes to linking and the event storyline can be planned/stay intact! filloo has now passed his trial so he is now a full Room Builder! You had an idea for a room and you made it happen within a day! As always you made your room awesome to look at as well as making a game that stuck to the story! This is always a hard one because we have so many amazing builders. It is always so hard to decide on one room! So we have decided to look out for the details in rooms… them small added furnis in room can make a massive difference! This months room of the month is... Dreamyard by @filloo;This room stood out the most because the way filloo stacks furni to create a new effect and add finer details into his room really makes you look twice! 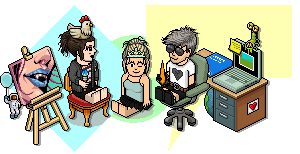 User who built the most rooms for this event was… @Its.Dino & @Deactivate! with 4 rooms each..
Last edited by Deactivate! ; 13-04-2019 at 06:22 PM.